The opener blasted five sixes and seven fours in his fiery innings as the hosts chased down a 130-run target inside 16 overs, the period they had to do it in to earn the added point that secured qualification. The Paarl side, who got to their target in 15.2 overs, will now go on to face the Jozi Stars in the Qualifier at the Bidvest Wanderers on Friday, and they will feel deservedly so, having turned in a clinical all-round display in their final match in front of their home fans. 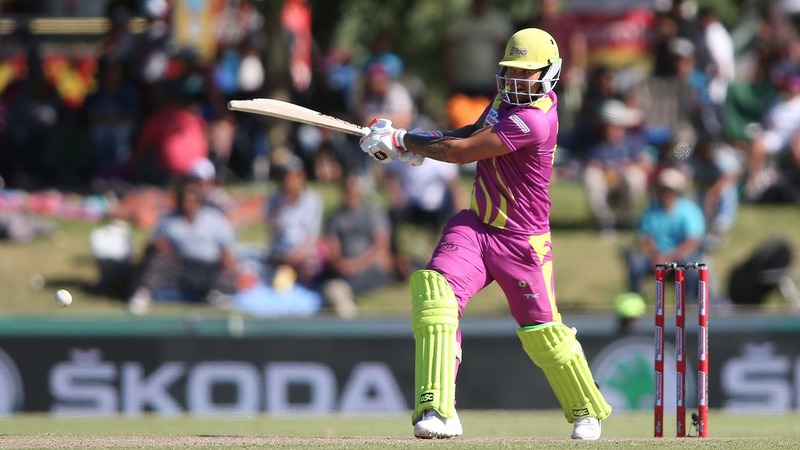 Delport was the cornerstone of their batting, but it was the bowlers who put in the hard yards earlier by restricting the Giants to 129 for eight. Dwayne Bravo was the pick of the lot with his three for 22, but almost all of the bowlers shone. The visitors had won the toss and opted to bat first with captain Jon-Jon Smuts (11) and Jason Roy (22) serving up a decent start by reaching 39 for one in the sixth over. But Kerwin Mungroo (1/26) and David Wiese (1/19) removed the pair to jolt progress, before Bravo began to chip away. It was soon 54 for four, and with Tabraiz Shamsi (1/15) also ramping up the pressure, top-scorer Rudi Second had to dig deep with a patient 37 off 41 balls to prevent a total collapse. The men from Port Elizabeth only crossed 100 in the 17th over, before Chris Morris blasted an unbeaten 27 off 10 balls to give them an outside chance. They did make a strong case by restricting the hosts to 52 for two at halfway – Faf du Plessis’s prised scalp amongst the men to go – but they needed more wickets, which never came. Delport then teed off to blast them into the play-offs. The result in Paarl also means that Wednesday’s late game between the Tshwane Spartans and Durban Heat is now a dead rubber.